Why this exhibition? The Fawcett Society is the UK’s leading charity campaigning for gender equality and women’s rights. It has been advancing women’s equality since 1866. 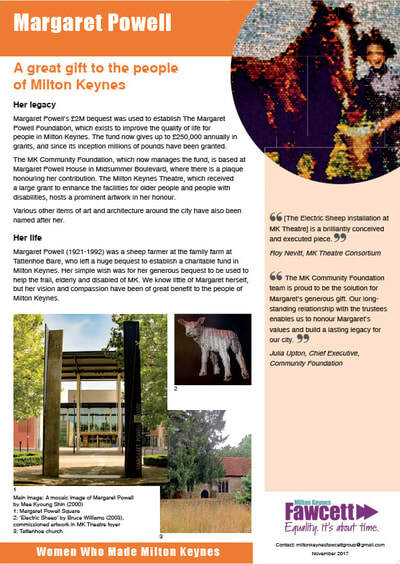 In this spirit Milton Keynes members wanted to make a contribution to MK50 by celebrating the role that women had played in the creation of our new city. It seemed to us that we had two options for doing this. One would be to highlight and celebrate the lives of the thousands of women citizens of MK who live here and make it a dynamic community. The other would be to uncover those women from our recent past, who are ‘hidden from history’ as feminist historian Sheila Rowbotham famously put it - the women pioneers who rarely make it into the histories of Milton Keynes, but who were crucial in creating many of the places and institutions that give our city its special character. ​This second project appealed to us because of our skills in research and writing, but also because it seemed to us that so many of the articles and TV documentaries about the early days of Milton Keynes never mention key women. When Milton Keynes was planned in the 1960s and the first building developments began in the 1970s, there were few women professionally involved in town planning, architecture or in political positions of power overseeing this new project. It was a period when women’s place was still deemed to be ‘in the home’. So it is not a surprise that women were excluded from public roles and professions, or that they were not acknowledged at that time. But we have no excuse for continuing that exclusion. We therefore decided to research women who have actively shaped the development of the city since the 1960s and 70s. The result of our research is this exhibition, where we celebrate 10 women. We do not claim that these are the only pioneering women who made a significant impact on MK, but pragmatically these were the 10 pioneers about whom we were able to find significant information. Space and time did not allow us to research a longer list. We think these 10 women are an inspiration to those of us living in a time when the world is more welcoming to women professionals and innovators. If we have not included your ‘Heroine’ we apologise. 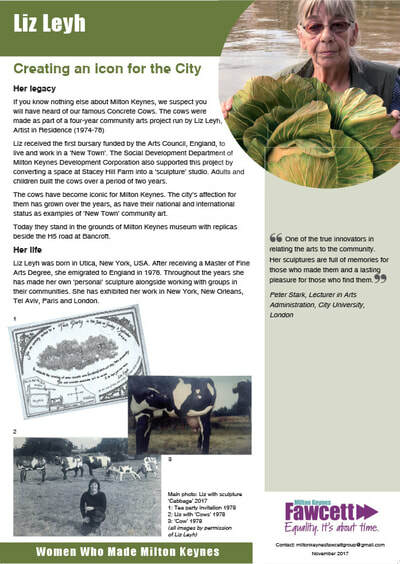 We hope that our omission stimulates you to research, celebrate and promote the lives of those other women pioneers that you feel should also be included in any exhibition entitled: Women who made Milton Keynes. 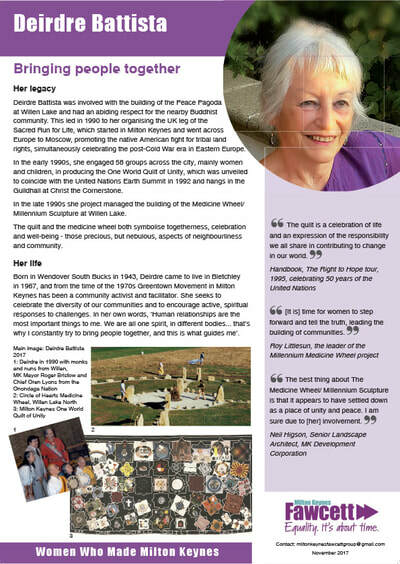 Deidre Battista, community activist who, in the 1990s, project managed the creation of the One World Quilt of Unity that hangs in the Guildhall at Christ the Cornerstone, as well as the building of the medicine wheel/millennium sculpture at Willen Lake. 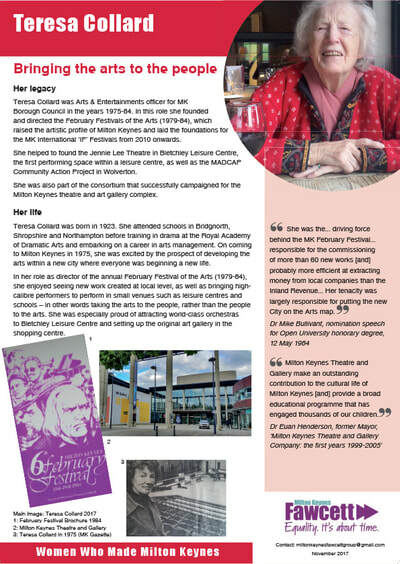 Teresa Collard, former Arts and Entertainments officer for MK borough, who founded the original MK February Festival of the Arts (1979-84) and was part of the group who campaigned for the MK theatre and art gallery complex. 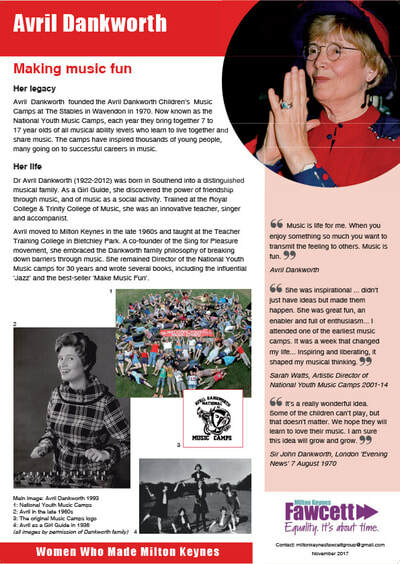 Avril Dankworth, musician and author, who in 1970 founded the National Youth Music Camps, still held annually at The Stables in Wavendon. She remained their Director for 30 years, enthusing and inspiring generations of young music-makers. 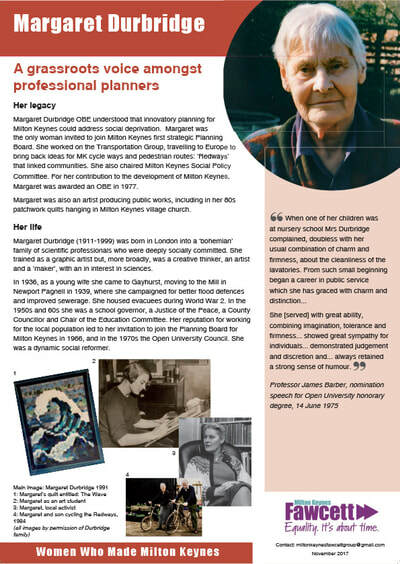 Margaret Durbridge, JP, the only woman who was invited to join the first strategic planning group for Milton Keynes new city, and promoted the concept of the ‘Redway’ cycle paths. 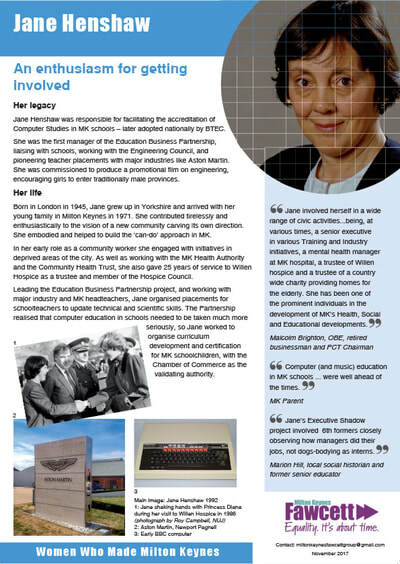 Jane Henshaw who, amongst many community involvements, facilitated the accreditation of Computer Studies in MK schools (later adopted nationally by BTEC), as well as managing the Education Business Partnership pioneering teacher placements with major industries. 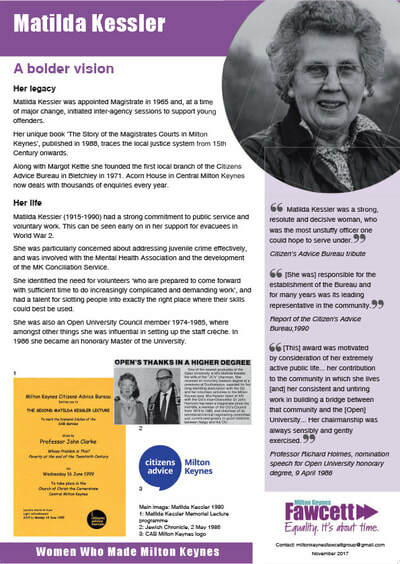 Matilda Kessler, JP, who initiated inter-agency sessions to support young offenders and was involved with the development of the MK Conciliation Service. She also founded in 1971 the first local branch of the Citizen’s Advice Bureau. Liz Leyh, the first ever ‘artist-in-residence’, 1974-78, co-funded by the Social Development Department of the MK Development Corporation in collaboration with the Arts Council. She created the Concrete Cows, now a major icon for Milton Keynes. Margaret Powell, local sheep farmer, who bequeathed a legacy, now managed by the Community Foundation, to improve the quality of life for people in Milton Keynes, especially the frail, elderly and disabled. Marjorie Reid, local GP who, along with district nurse Dorothy Jell, founded Willen Hospice and became its first Medical Director. 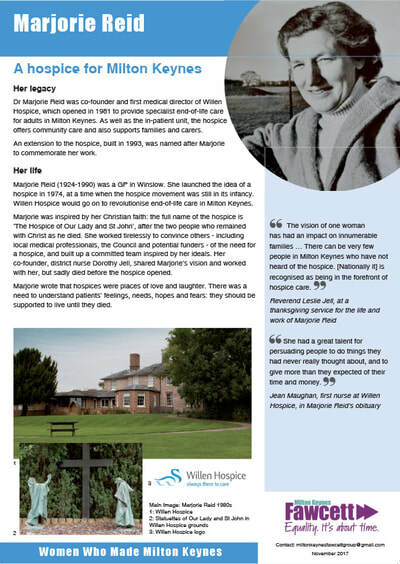 An extension to the hospice, built in 1993, was named after Marjorie to commemorate her work. 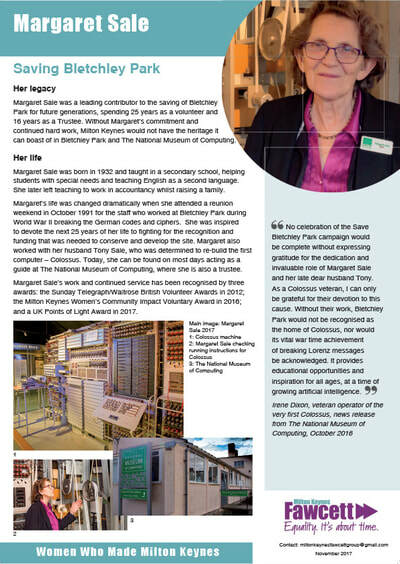 ​Margaret Sale, who was a leading contributor to the saving of Bletchley Park for future generations. She has devoted 16 years as a Trustee and 25 years as a volunteer, and has played a pivotal role in the founding of The National Museum of Computing.